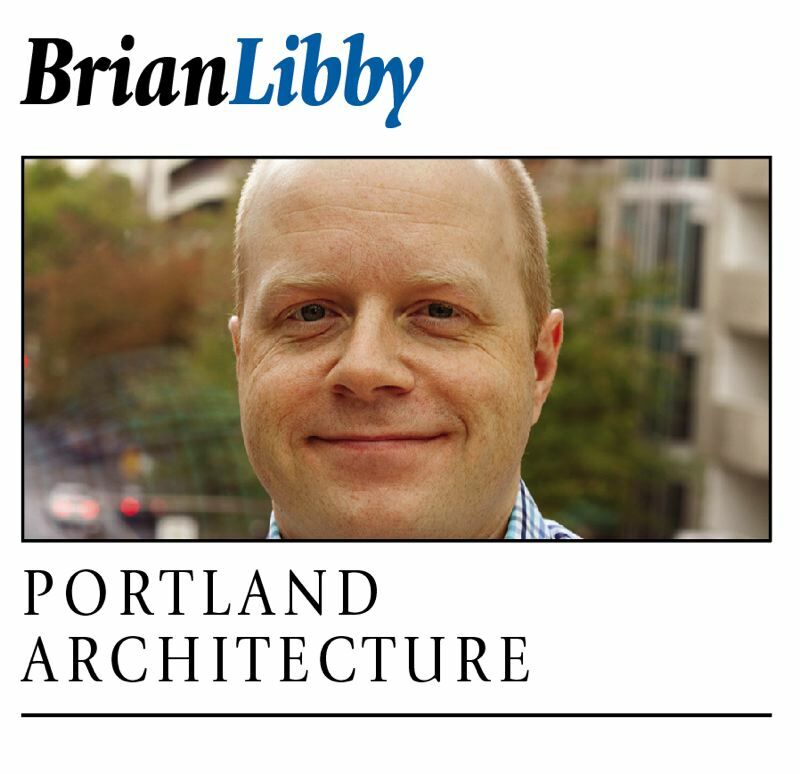 In Portland's recent building boom, hotels have been some of the biggest projects. There is the 600-room Hyatt under construction beside the Oregon Convention Center after years of delay, to cite one massive (and ugly) example, and there is the comparatively handsome Canopy by Hilton recently completed in the Pearl District. And they keep on coming. 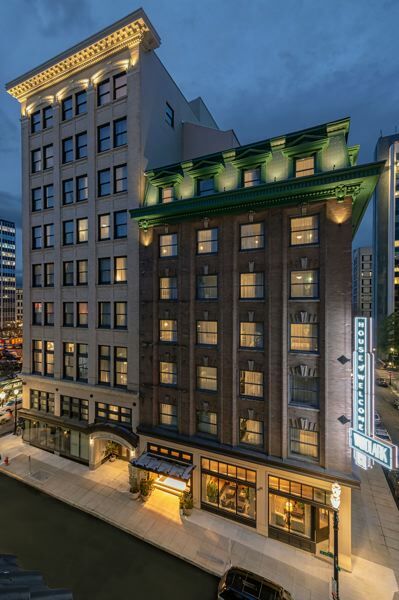 A Radisson RED hotel just opened in the Broadway Tower, and an upcoming 33-story building recently approved by the Portland Design Commission includes a five-star hotel as its anchor tenant. But size isn't everything. Hotels are selling location and ambiance, be it in their surrounding neighborhoods or within their walls. It's not the square footage but what you do with it. Just ask the developers of the Hoxton Hotel and the Woodlark Hotel. The original buildings their developers were working with vary greatly in quality: one possessed magnificent detail and the other was largely unremarkable. But both ingeniously combined two structures in order to pencil out. Historic renovations always come with risk, but what they got in return was more design quality and style than virtually any of their new-construction competitors. You can't block out 50 rooms for your convention, but because these hotels didn't have to start from scratch and they invited great homegrown food and drink purveyors, you might actually encounter a local voluntarily hanging out there. Call it the children of the Ace Hotel, which has demonstrated a Midas touch for creating hot new gathering spots out of old brick and mortar. When Naito Development purchased the circa-1907 Grove Hotel in 2014, the $22 million investment in Old Town Chinatown was seen as a gamble. 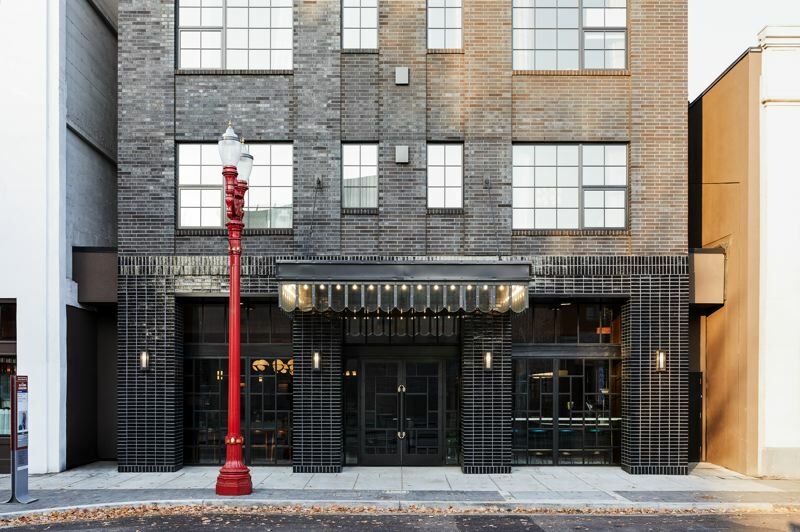 But on the eve of opening in 2017, the property was sold (at a substantial profit) to another developer, London-based Ennismore International, as an expansion of its chic Hoxton Hotels brand. The original Grove building had long since been decimated by past expansions of Burnside Street that basically cut it in half. In-house architects from Ennismore designed a nine-story brick-clad tower that, despite being bigger than the original, remains deferential. Inside, the Grove-to-Hoxton metamorphosis is particularly striking thanks to London interior design firm Fettle. Voluptuously curvy oversized chandeliers cast golden light onto immaculate paneled wood walls, yet the overall feel is casual and residential. The new Woodlark Hotel also took two to tango, combining the circa-1912 Woodlark building (by A.E. Doyle, designer of so many early 20th century Portland landmarks) with the circa-1908 Cornelius Hotel building next door. Just a few years ago these elegant National Register-listed buildings seemed destined to meet the wrecking ball. Today, thanks to investments from Provenance Hotels and developer Arthur Mutal Investments, as well as the design from architects R&A Architecture & Design and interiors by Staicoff Design Company, the buildings look better inside and out than they have in a century. And given that the renovations for these unreinforced masonry buildings included seismic bracing, they'll probably be here for another century. Don't get me wrong: new hotel buildings can be excellent too. The Jupiter NEXT proved that last year. But most of the biggest hotel buildings in our central city have tended to be for the biggest and most generic corporate chains, and it shows. The Hoxton and the Woodlark are different: they seem born of this place, and they feel authentic.